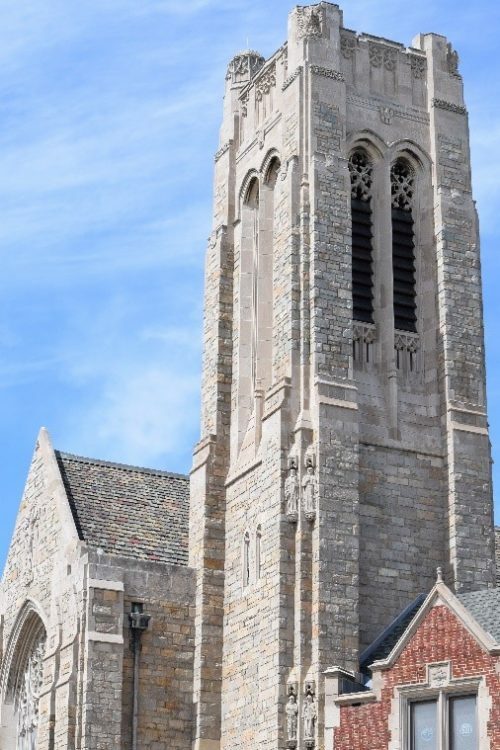 As one approaches the front of the church on Gratiot, it is a delight for all lovers of Trinity to see the beautiful tower of the church as it gracefully soars up to a height of 104 feet like the standard of a conquering army. The tower represents the tower of mediaeval castles which were the fortress for the defense of the complex. One corner of the top of the bell tower is taller than the others, this was a signature of the Architect William E. N. Hunter (1868-1947) signifying this was one of his buildings (others in the areas are Jefferson Ave. Presbyterian Church on East Jefferson in Detroit; Grosse Pointe Memorial Episcopal Church on Lakeshore Dr. in Grosse Pointe; and Christ Episcopal Church on the grounds of Cranbrook in Birmingham). Gracefully, the many colored granite stones are piled up to meet the unusual carvings in limestone at the crest of the tower. One also takes immediate notice of the unusual position of the tower as it is located in the fifth bay of the nave. This unusual position was made necessary due to the fact that the building site is triangular in shape and the church had to be shifted on its axis in order to get the longest possible measurement in the nave. 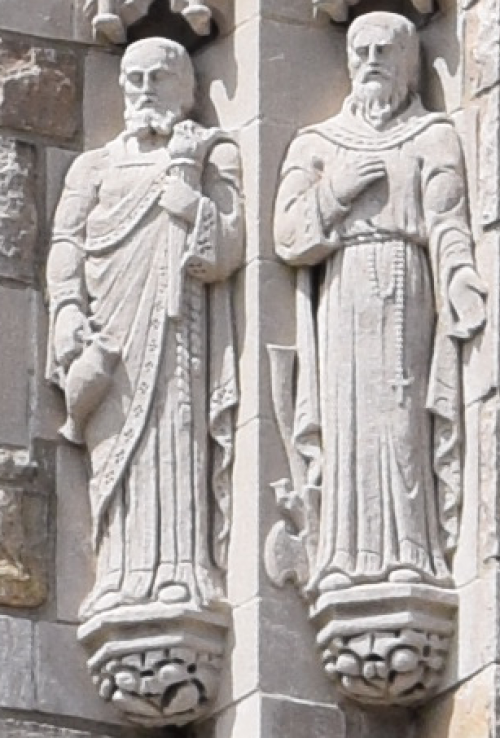 As the eye travels upward from the street, 30 feet above the street level are the figures of the defenders of the faith. 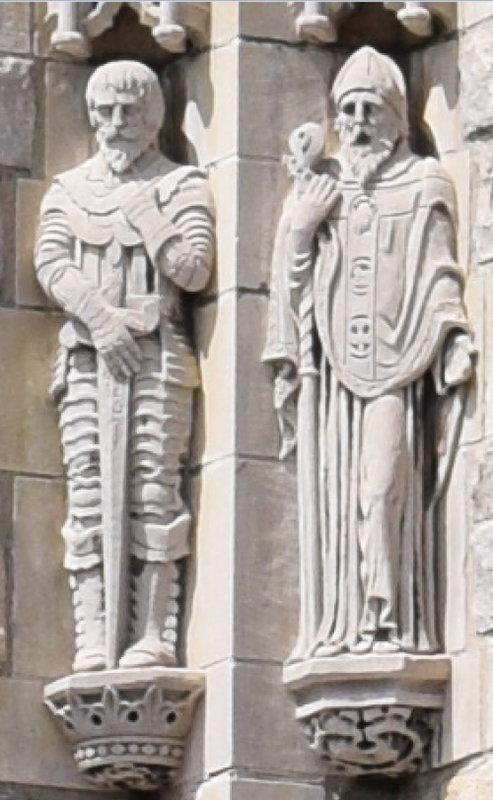 There men were fighting heroes of the faith and belong on the tower which suggests Church Militant, conquering all her foes. Gideon was one of the fighting judges of the children of Israel whose 300 men conquered a mighty host of the enemy (Judges 7:8), declaring “The sword of the Lord and of Gideon”. St. Boniface was a pioneer missionary to the Germans, who chopped down the old oak tree of Thor which they had worshipped as a god. He proclaimed to them the real God, and led the Germans to Christianity. He holds in his hand the ax. King Adolphus was the one who rescued the cause of Lutheranism from Roman Catholic oppression 100 years after the Reformation, and participated in the tumultuous 30 year was, 1618-1648. King Adolphus is standing upon which his kingly crown and dressed for battle. Bishop Athanasius was a fighter for the pure doctrine expressed in the Nicene and Athanasian Creeds. He was founding father of the church fathers, who fought for a clear and correct doctrine regarding the Trinity as one God and yet three persons. The Cathedral Bells are 15 cast bells on the 7th level of the bell tower. Eleven of the bells were made by John Taylor Bell Founders of Leicestershire, England. The eleven bells are a tribute to the Gauss family. On the largest bell (above), which weighs 1,727 pounds, are the following words: “To the Glory of God”. This chime of elevens bells was given to Trinity Lutheran Church by Mr. and Mrs. Charles Gauss of Detroit in 1930. 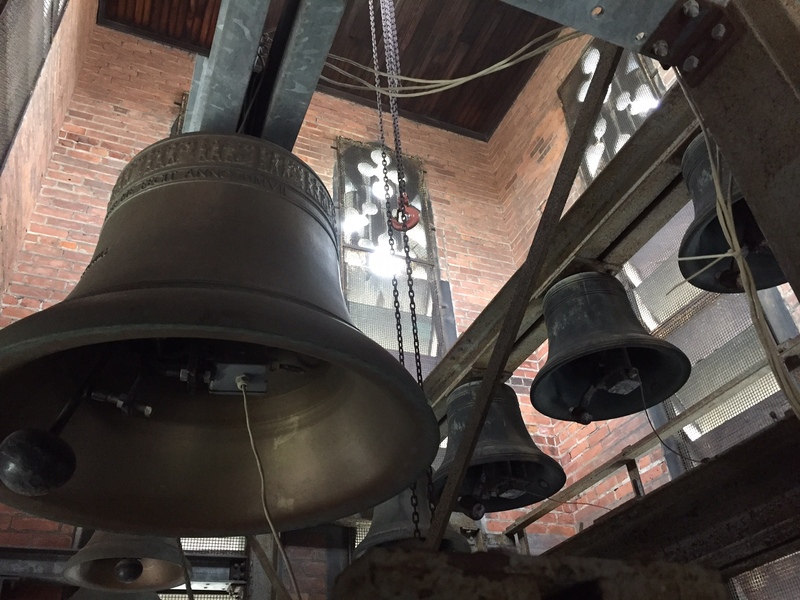 In September of 2007, four additional bells that were made in Holland were added by Calvin Bruning family. 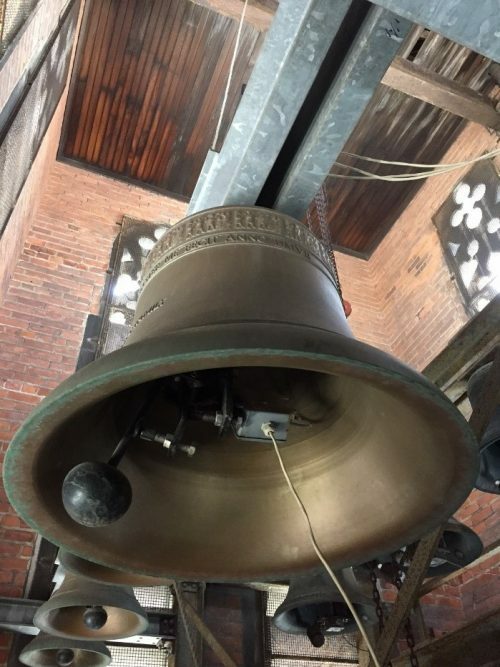 All of the bells have been refurbished and provided with electronic clappers that are operated by an electronic computerized carillon systems that was installed by Chime Master Systems of Lancaster, Ohio. They include musically one and one half octave. In 2017, Ringside Creative of Oak Park, MI—the in-stadium, in-game AV company of the Detroit Lions and Ford Field—recorded the bells of Historic Trinity for exclusive play at NFL games in Detroit. During the 2017-18 season, Historic Trinity will be featured as the bell tolls to encourage Lion’s fans toward fandom. The interior of the bell tower is reached through a trap door in the organ pipe chamber, which is reached through a door in the Dau Library on the third floor of Otte Hall. There are seven landings in the tower, each reached by a straight perpendicular ladder attached to the walls. The bell tower contains the bells and an instruments used formerly for playing the bells by hand. The top level of the tower exits outside, by a trap door, to the top of the tower.